On Wednesday night Cole Hamels, along with Cardinals pitcher Lance Lynn, became the first pitchers in the 2012 season to reach 7 wins. Cole Hamels must hate me. I went to see him pitch the Phillies Home Opener in April, The Marlins got to Cole for 4 runs while the Phils offense struggled against Anibal Sanchez. Hamels took the loss - since then he has been undefeated, winning 7 consecutive decisions whiile the Phillies came home with victories in all 8 of his other starts. That lone 2012 blemish is not the only reason Cole Hamels may have an issue with Team Phungo. The fine photo on the above card was taken during a game from June of 2010. Hamels wasn't steller but he was solid enough that the Phils had a 5 run lead going into the 9th. A comination of relievers blew that lead, which included a Titanic Home Run to center by Jim Thome off of Jose Contreras. Truth be told, I have seen Hamels on the Winning side of a lot of ball games, including a couple of post season games. The Phils are scuffling and hovering aroudn that .500 mark, it is nice to have a brigh light in their 2012 season, which has been so difficult to watch this year. I desperately need to get caught up on trade posts, and will try and knock out a bunch of them in the next couple o weeks. This unfortunately means that I will likely not dedicate the time and effort to them that they deserve. Chase took ground balls during BP today for the Phillies. We are past the quarter pole in the 2012 season and the Phils haven't seen either Utley nor Ryan Howard. Hope we hear from the soon. The two cards above are just a pair of the many cards that Ryan sent over. He knocked out several cards off my Phillies checkers, and another pile of cards from the 2011 Heritage set. 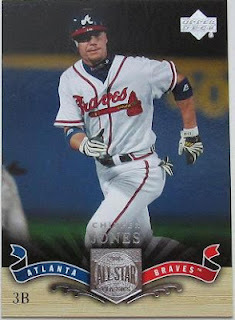 The 2011 Topps Heritage is a set that I am buiding by default, partially in the name of journalistic research delving into potential hot-boxes in last years set. FYI I did not get a hot box. My Phils Topps 1980s Collection Want List is Here. My first impressions on Topps Archives is a thumbs up. The price tag on this rack for a single 14 card retail rack pack was $5.34 at my local big box store. That's right the 14 card pack included 3 Phillies!!! which is probably a record for a small pack for myself. I like this set better then what Topps did with Lineage last year. The base cards in Lineage was just to drab for me. It doesn't hurt that the four years that were chosen for Topps Archives 1954, 1971, 1980 and 1984 are among the better designs in the Topps arsenal. My 2 initial complaints are 1) The cards are on the newer posterboard rather then the classic cardboard upon which the original sets were produced. 2) The 5.30/pack retail price comes out to over 40 cents/card - kind of heavy for retail. Regardless, my first impression is a good one. I haven't looked at the cards much in detail, but I am thinking that a Hobby Box may be in my future. The 200 card set size appeals to me, there appears to be a fun array of inserts - although they may be a bit confusing. There is one other thing I like about Archives - judging from my limited 13 card sample, I like the photography - the shots are cropped as tightly to the subjects. I am a fan of trying to figure out what game in which the photos were taken. The last few years Topps has delivered some great digital close ups, but they are often too close for my liking. We had the opportunity to visit Rod from Padrographs while my wife was at a conference in Portland, Oregon. Rod is responsible for a bookstore that sells the used books from the county library. Near as I can tell Portland must have one of the most successful library systems in the country. In fact shortly after I left Rod, I was at Voodoo Donuts and the young man working the counter saw a book that I had bought at the start and congratulated me for having a library book while on vacation. We only met for maybe a half hour but Rod was able to give us some good background on Portland's history, geography, and culture. He also showed us around the store pointing me in the direction of the baseball books. The book I picked was a copy of "The Corporal was a Pitcher" about 50s era Philadelphia Athletic Lou Brissie. I think Rod is only the third card blogger I have met in person - once again it was a pleasure. Rod is just as funny in person as his writing. One of my favorite parts of the afternoon was when one of the customers got upset with us for talking to loud while he was perusing books. Bummed out to hear rumors of Kerry Wood retiring. Something about a guy coming up with so much hype and he really answered the bell in the beginning - He was a key guy with the early 2000s Cubs teams that came so close to breaking the curse, but injuries just hampered a "what could have been" career. And there will always be The Kerry Wood Game. Wood did not receive a single Cy Young vote during his career, including 2003 when he led the league with 266 Ks. 67 of his 86 career Wins came between 1998-2004. There are dozens perhaps hundreds of Kerry Woods scattered across Baseball History. Stephen Strasburg could have a Hall of Famer career, he could also have a Kerry Wood career. Blurry photo above taken prior to a game in 2010 where Wood got an inning of solid relief in during an Indians 2-1 loss to the Phillies. On Wednesday night Jamie Moyer earned another win resetting his own record of holding the distinction of being the oldest player to win a Major League ballgame AND he set a record with his BAT by recording an RBI an RBI - which has never been done by anyone older. Today I want to take a look at an event on the other end of Jamie's career that involved a Future Hall of Famer who also recently reached an age plateau. On Monday 5/14/2012 Tony Perez celebrated his 70th birthday. Here comes your Phun Phact - Jamie Moyer once pitched to Tony Perez - recording 3 Outs vs the Future Hall of Famer while recording a 3-2 victory in August of 1986. The Topps RC for Tony Perez is the #581 card in the 1965 set. Hard to believe that there is an active pitcher that pitched to someone who played in 1964 and had a card issued in 1965. Moyer has pitched to batters whose birth years have ranged from 1942 to 1990 (Starlin Castro). The Team Phungo trip to SafeCo field in Seattle went pretty well. Seattle is a little out of the way from our Philadelphia base, but we had the opportunity to include the game in a trip to the Pacific Northwest and were happy to make the extra stop. The hometoown Mariners lost the game 6-4 to a Detroit Tigers squad which sent out their ace Justin Verlander. Former Phil Kevin Millwood took the mound for Seattle. The Tigers got to Millwood early getting 5 runs in the first 2 innings. Verlander wasn't overpowering - but pitched well despite having issues with the plate umpire - Jim Leyland's disagreements with the umpiring crew got him ejected from the contest early in the game. Verlander only went 6 innings, he was over 100 pitches and still hit 97 on the gun. The Mariners don't make it to our area often, and this may be the last time I see Mr Suzuki play live. Ichiro was able to get one of the 7 hits that Verlander allowed to the Mariners. The Mariners have struggled the last few years was evidenced by their modest draw on a chilly Tuesday night, but even if the team isn't doing well, they have a lot of nice things for fans to check out like this Display of Seattle related baseball cards. There is a Mariners Hall of Fame, and several other cool features at the stadium. Insane food selections are featured at the park as well as a pre-game happy hour. Another nicety at Safeco is that they have free re-entry as long as you scan your ticket when you leave. Another nice feature of SafeCo is how close you can get to the field, especially in the bullpen areas. This is how Mr Kelley appears when warming up prior to giving up a mamoth Home Run to Prince Fielder. Team Phungo just took a few weeks off to hit the Pacific Northwest. A good time was had by all. Caught a ballgame, Met a Cardblogger, and was welcomed home by a flurry of card packages from fans fo the Phils, Braves and Astros. Will get some swag postings up in the next couple of weeks. Also have a trade package I am trying to get out the door for O's Fan Ryan. Hey Topps, If your going to include a jerk in your product, lets stick to superstars with almost mythical accomplishments, Like Ty Cobb. 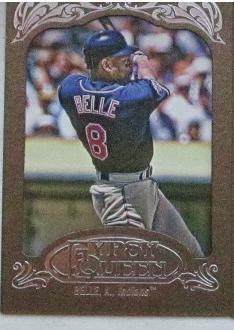 But Not stinking Albert Belle. Is there anyone out there that collects Albert Belle Cards - and here he is not just showing up in Gypsy Queen but showing up as one of my special inserts. Today less is more and we have a special Phungo 4 edition of P5 with Braves authority Cardboard Junkie. This may be hard for some readers to believe but DayF went into an extended rant on Q5 and I felt it warranted a separate posting. Today we will handle the first Four Qs. > is Chipper Jones bobble head night. > Murphy signed a bunch of cards recently! > guy you should be absolutely terrified of though is Chipper Jones. > with the MVP, I'm sure of it. We will hand out a 3 for 3 for today - DayF has really covered his bases on the last question pretty much naming every Brave other than Jerry Royster, we will wait on the seris outcome to see if any of these players get to the Phils this week. Looking forward to seeing the Don Mossi Sketch card - I see it being one big ear. And looking forward to a report on that Bobblehead Night if it falls together. Philadelphia Phillies - The Phillies Room. New Phungo Challenge for May. Who on this list will be the first to Hit a Homer in 2012. And how many hit homers before Albert Pujols? The Chick on DWTS who was trending yesterday. Cute barista at my starbucks. The Squirrel on Skip Shumakers Topps Card. Phillies get a Win 6-4 largely due to a fine outing by Vance Worley, 1 Run over 7 innings. Phils strung together a couple of hits off Chris Volstad early and were able to get 4 first innings runs. Offense then returned to their more typical dorment form. Chad Qualls blew the lead in the Top of 8th when he gave a up a Home Run to Bryan LaHair who is having a breakout year. Phils got the lead back in the bottom of the inning thanks to a timely 2 run double from Placido Polanco. -I guess I must be getting better about what I eat. It was a dollar dog night, and I resisted the hot dog temptation. -I am surprised I was unfamiliar with Campana prior to this weekend - The Cubs had such a rought 2011 that they must not have made it onto my radar. He appears to use the LH slap hitter technigue, we have seen from Ichiro a lot. Getting several steps down the line while swinging. - Phils got 2 bunt singles (Jimmy Rollins, Pete Orr) while they were able to retire Campana on his bunt attempt. - Jim Thome didn't play and the Phils have several players that may be coming off the DL soon. He hasn't looked good at the plate and I am wondering if he gets involved in another Phils Home game. - Papelbon's save was his 8th in as many attempts.